The FF102/25 Ventilated Fire Barriers are high expansion intumescent seals offering industry leading performance as Ventilated Cavity Fire Barriers / ‘Open State’ Cavity Fire Barriers. The products have undergone extensive fire testing and are suitable for use within the majority of construction types, enabling the versatile system to be specified with confidence and provide the installer with a simple, time saving and site friendly solution. 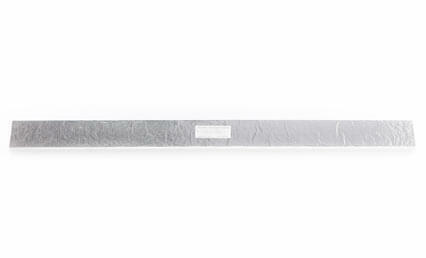 The FF102/25 Ventilated Fire Barriers are rigid, high expansion intumescent strips encased in aluminium foil. The FF102/25 can be mechanically fixed both horizontally and vertically within ventilated cavities behind rainscreen or cladding systems to act as a cavity fire barrier. Up to 2 hour fire tested to standards including: BS476: Parts 20 and 22, EN1363-1: 1999, EOTA TR31 and assessed to TGD19 ‘open state cavity barriers’ to ASFP standards for ventilated facades. Tested in combustible and non-combustible cavity constructions.